NHS 111 is a national advice and help line for all medical problems. 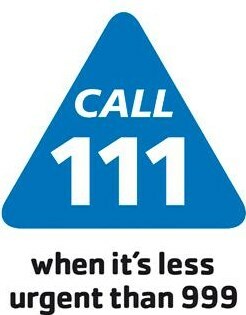 Simply dial 111 or visit www.nhs.uk/111. In an emergency when the surgery is closed please contact this out-of -hours service on 111. Other than in an emergency, please use this service before attending the A&E department at the hospital. Your local pharmacist is qualified to give you expert advice. Brighton Station Walk-in Centre, Aspect House, 84-87 Queens Road, Brighton, East Sussex BN1 3XE. Royal Sussex County Hospital, Eastern Road, Brighton, East Sussex BN2 5BE.